Inside Namrata Shirodkar's Vacation With Kids. But Where Is Mahesh Babu? 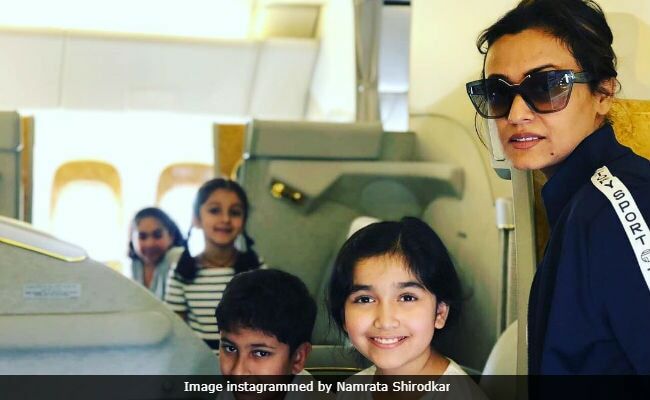 Namrata Shirodkar is posting vacation pictures featuring her "gang of kids" but we are missing her husband Mahesh Babu, who seems to have skipped the vacation this time. Namrata's son Gautham and daughter Sitara are accompanied by their friends - daughters of Dia and Krishna Bhupal. The kids are enjoying in the pool and seem to be enjoying each other's company. But where's Mahesh Babu? The actor featured in pictures posted by Namarta Shirodkar over Christmas, which he also shared on his verified twitter account. But since then, Mahesh Babu hasn't posted anything. On the sets of Thums Up charged nascar race track California !! Mahesh Babu was last seen in Spyder, which was a gigantic box office success. In 2018, the actor has two releases - Koratala Siva's Bharat Ane Nenu and Vamsi Paidipally's (tentatively titled) MB25. With Koratala Siva, Mahesh Babu is collaborating for the second time. Their last film together was 2015's Srimanthudu, for which he won several awards including Best Actor Nandi Award. Mahesh Babu has two more films in the pipeline - pone with each Trivikram Srinivas and SS Rajamouli. Bharat Ane Nenu also stars Kiara Advani and R Sarathkumar and it is expected to hit the screens in April 2018. Therefore, it is possible that Mahesh Babu may be busy with the film's work or he may join his family later. We hope to see more pictures of Mahesh Babu.